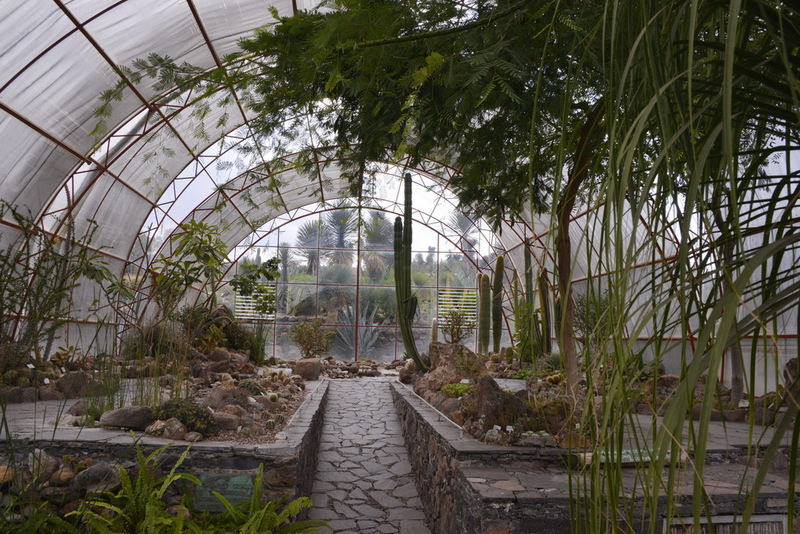 It’s only an hour’s ride on asphalt to San Miguel de Allende, the town made famous in cactology as the place where Charlie Glass inspired and set up the project often referred to as C.A.N.T.E., known here as El Charco del Ingenio Jardin Botanico. I was also keen to see the place where in the 1990’s Brian Thomson, a friend from the UK, had spent a number of months as a volunteer to help Charlie teach Mexicans the basics of cactus horticulture, including the art of grafting. Brian’s health is not so good these days so I hope he’ll enjoy the pictures once I get home. I had heard that the place was on a down ward spiral in recent years, but was pleasantly surprised to find the car park full with a better than expected number of visitors, including a group of visitors from the UK – was it Nottingham or Northampton Branch – there goes my memory again! Not a bad branch outing! All the plants were well labelled, but some of the smaller plants looked a little lost in the tall grass – very au natural, but perhaps a better maintenance standard is expected in a botanic garden. It’s easy to be critical during a one off visit, but similar comments were heard from UK, US and Australian visitors as I walked through the garden. A group of school kids in uniform on a school outing shows that the place is also used educationally to help people to learn about their local plants and their uses. An interesting stop to a place that I had heard and read much about over the years. Main plant house, well maintained with interesting cacti and other succulents. We found three single rooms for the last two nights to enable us to get a good night’s sleep and do a final repack before Saturday’s flight home in the centre of town – a bit noisy until the music in a near by bar was switched off around 4 a.m., but as usual I was fast asleep as my head hit the pillow around 22:00 hrs. Bart spent the afternoon resting while Alain and I, armed with our cameras took a stroll through the very scenic and touristy town – many Americans but also European tourists seem to enjoy a taste of Mexico so close to Mexico City. I heard Dutch spoken on the cafe terraces as we made a pub crawl from bar to bar to escape the heat of the sun and even spotted a car with an ‘I love Middelburg’ sticker, but with Mexican plates. Some one else who had managed to swap cold wet European winters for the Meican sun shine?